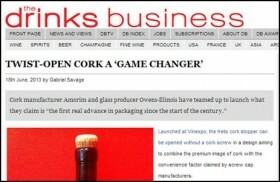 Launched at Vinexpo, the Helix cork stopper can be opened without a cork screw in a design aiming to combine the premium image of cork with the convenience factor claimed by screw cap manufacturers. The product represents the culmination of four years’ work between the two companies, who have invested a combined sum of around €5 million in its development during this period. Covered by three patents, the design features a helix-shaped groove cut into the bottle, which works with the cork’s natural elasticity to allow consumers to open the bottle with a simple twisting motion. According to its creators, the design has displayed “no statistically sensory difference” from a standard cork closure after 26 months storage. Helix has also been tested satisfactorily in an accelerated aging process, which saw bottles stored horizontally for 30 days at a temperature of 35°C. “This has the potential to be a game changer for the wine industry,” said Carlos de Jesus, marketing & communication manager for Amorim, as he introduced the product. Citing only “minor adjustments” that needed to be made on bottling lines, de Jesus reported that both Amorim and O-I were also “very confident” in the reaction from 12 wineries in three countries who have so far trialled Helix, although no listings have yet been confirmed. With IPSOS Consumer Research carried out in China, the US, UK and France pointing to “overwhelming acceptance” of the Helix among end users, de Jesus highlighted the closure’s “festive pop” as proving particularly crucial to this positive response. In response to concerns about the ease of tampering with a design that is so simple to open, de Jesus noted the option for clients of adding their own capsule around the cork. Designed solely for the still wine market, Helix is targeting “a significant part” of the “popular premium sector,” which the companies calculate as accounting for five billion units within Europe alone.